Background: In small children, conduits for right ventricular outflow tract reconstruction are limited because of patient size and conduit resources, particularly in Japan. Methods: Since 2007, we have performed the Rastelli-type procedure using 16-mm hand-made trileaflet expanded polytetrafluoroethylene (ePTFE) conduits in nine approximately 1-year-old children. 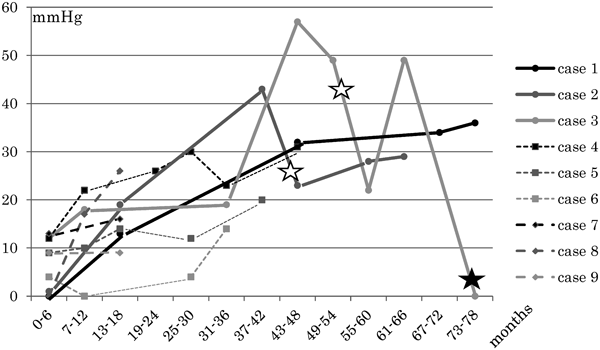 The median age and body weight at surgery was 17.3 months (range: 10～22 months) and 8.9 kg (range: 6.8～11 kg), respectively. The patient diagnoses were double-outlet right ventricle (DORV) with pulmonary stenosis (PS) in four, pulmonary atresia with ventricular septal defect (PA/VSD) and major aortopulmonary collateral arteries (MAPCA) in four, and PA/VSD in one patient. All patients had undergone previous surgical procedures, including modified Blalock shunt in five and unifocalization of MAPCA and modified Blalock shunt in four patients. Conduit function, re-intervention, and right ventricular function were retrospectively investigated. Results: There was no early or late mortality. During the median follow-up of 45 months (range: 18～79 months), balloon dilation for conduit stenosis was performed in two patients at 47 and 51 months post surgery, respectively. One of these patients required conduit replacement 27 months after balloon dilation. Excluding this patient, the most recent echocardiographic pressure gradients of the conduits were 0～20 mmHg in four, 21～40 mmHg in four, and no patient had conduit stenosis with the pressure gradients over 41 mmHg. 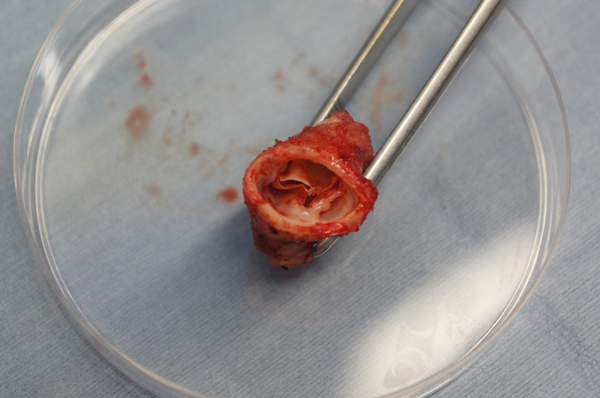 Conduit regurgitation was trivial in four, mild in two, and moderate in two patients. Conclusion: The Rastelli-type procedure using 16-mm hand-made trileaflet ePTFE conduits in approximately 1-year-old infants showed acceptable mid-term results. Conduit stenosis gradually developed over 5～6 years. Balloon dilation for conduit stenosis has the potential to delay conduit replacement without increasing conduit regurgitation. a: The fan-shaped trileaflet is trimmed from a 0.1 mm ePTFE membrane. b: The trileaflet is approximated to the ePTFE conduit, which is inside out, using a CV-7 continuous suture. c: Each commissure is approximated using a CV-7 U-shaped stitch for better coaptation. RVP: right ventricular pressure, PAP: pulmonary artery pressure, LVP: left ventricular pressure, PG: pressure gradient, EDVI: end diastolic volume index, EF: ejection fraction. DORV: double-outlet right ventricle, PA/VSD: pulmonary atresia/ventricular septal defect, MAPCA: major aortopulmonary collateral artery.